Recently, the Association of Malayalam Movie Artists (AMMA) decided to reinstate actor Dileep’s membership, an actor who is the prime accused in the abduction and sexual assault of a leading Malayalam female actor. In a press meet earlier, AMMA had publicly announced that they have expelled the actor in light of these charges. However, although the case is still under trial and Dileep has not been acquitted, AMMA President and vetran actor Mohanlal has reinstated his membership, with the support of a few other influential AMMA members. Following this, the actor who was abducted resigned from the organisation. 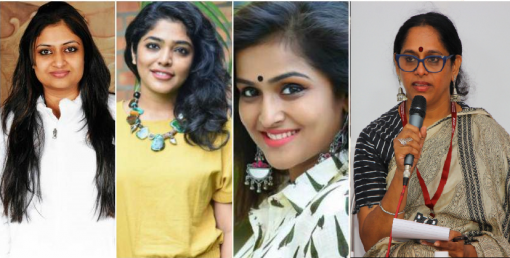 In support of the female actor, and to register their protest against the organisation's decision, three of its important members, Rima Kallingal, Remya Nambeesan and Geetu Mohandas, also resigned. The Indian Writers’ Forum spoke to actor and member of Women in Cinema Collective (WCC) Sajitha Madathil on this issue. The WCC, which has supported the female actor from the beginning, has condemned AMMA's decision. Sreelakshmi (SL): What is the recent update on the AMMA taking back Dileep in its council? Sajitha Madathil (SM): The actor Dileep is still the prime accused in the abduction of a female actors’. He has been called by the court for the deposition along with the other accused. The Association of Malayalam Movie Artists (AMMA) council had earlier declared that the actor has been expelled from the association. All the actors supported the move taken by the film body. But in AMMA’s last meeting, differences arose regarding Dileep’s expulsion. Certain actors felt that he had atoned for his sins enough. They were apprehensive about his future, and expressed worry about the ramifications of AMMA’s decision on his career; they even expressed concern about the possibility of him being punished, among other things. Because of such misplaced sympathy of some influential actors, Dileep has been brought back to the council. For the past couple of months, since the matter came to light, AMMA has claimed, “Avalkkoppam annu” (We will always stand by her). But now they’ve gone back on their own decision. We were utterly shocked by the AMMA leadership. When the decision was made public, the actor who had survived the abduction decided to cut all ties with the organisation. How could we remain silent after that? She’s a strong girl. She doesn’t want herself to be called an “era,” a victim. In fact, she said that she doesn’t want the headlines to say “era rajivechu,” the victim has resigned. Out of respect for her decision, and to show our solidarity, the Women’s in Cinema Collective (WCC) decided that some of us will resign from AMMA while others will stay and fight within the organisation. That is why three other lead actors resigned from AMMA and another three continue to be AMMA members. They will continue the fight. The WCC, an organisation formed by the women in Malayalam film industry, has raised certain crucial questions regarding AMMA’s decision to reinstate Dileep’s membership. AMMA’s argument was that the accused actor had never been officially expelled from AMMA. This was another shocking revelation. How could they revert from their earlier claims? AMMA is treating the actors and the people of Kerala like fools. Mamooty, one of the biggest stars in the Malayalam film industry, had announced in a press meeting Dileep had been expelled. Do his words mean nothing? Remya Nambeesan, an executive member of AMMA and also a member of WCC, said that in the first meeting held by AMMA, the AMMA council had decided to ratify the decision in the next committee meeting, and that no clear decision regarding his expulsion was reached in this meeting. We don’t know what happened in the meeting after that. But in the general meeting — where the accused actor was reinstated — we were told that AMMA doesn’t have the authority to cancel membership; and, as per the law, since his case is still under trial, he is innocent until proven guilty and will continue to be a member of AMMA. These were the two things that were discussed in the general body meeting. But we came to know only through newspaper reports about all these things; that AMMA had lied in their previous statements to the press. According to one of the newspaper reports, in the second executive meeting by AMMA, they had decided that all the resolutions passed in the first meeting were now null and void. All this just makes our belief stronger that AMMA’s previous stance was a farce and the committee members successfully fooled the public. SL: I know that WCC has publicly condemned AMMA’s decision to reinstate Dileeep. Could you talk about why is it also important for an organisation like AMMA to take show their support for the actor who was abducted? SM: WCC, as an organisation that strives to create equal rights for female actors working in the film industry. We want to the Malayalam film industry to become a gender-equal space, be it on wage issue, safety of female actors, etc. We want to run things in an equal, democratic way. AMMA’s is a film artists organisation but its membership is restricted to actors. In Malayalam film industry, around 40 percent actors are female. AMMA needs to seriously take up the problems faced by female actors and set up mechanisms to address them. This is imperative so that when such issues come up, the organisation can take concrete steps to deal with and make the film industry a more gender-sensitive and equal space. For instance, AMMA should have taken the initiative to constitute bodies like the Internal Complaints Committee (ICC), especially since such issues of sexual harassment have already happened in the industry. SL: Three lead female actors and a director-actor have resigned from AMMA. What do you hope to achieve with this move? Why did they announce that they have expelled him? On what basis was the accused Dileep given his membership back? What has AMMA done to show their support for the female actor? Has it provided any kind of security to the female actor? What other efforts has AMMA made the work space female-friendly? We need to have such discussions in the film industry. WCC, as an organisation working for female members of the film industry, also needs to raise these issues with AMMA. SL: The Left government in Kerala has shown its solidarity with the four female actors who resigned from AMMA. But two of the MLA’s of the same government, who are also part of the executive council, have steadfastly maintained complete silence. Recently, the MLA K B Ganesh Kumar said in a statement, “the women who quit are the trouble-makers.” What you like to respond to that? SM: We don’t want to comment on such things. Gender sensitivity is not something that comes with a high political position. People need to think about the gender inequalities in our society; they need to be sensitive to the issues faced by the females in this country.